Synopsis: A college student (Alex Russell) and his roommates start a fake charity and scam gullible churchgoers into paying their tuition. Writer/director Will Bakke and his writing partner, Michael B. Allen, have challenged both Christians and Atheists alike to believe what they want to believe with their documentary films One Nation Under God and Beware of Christians. Now, the pair takes the same basic message to the realm of fiction with Believe Me. Believe Me stars Alex Russell (Carrie, Chronicle) as Sam Adkins, a law student whose scholarship expires, leaving him with a $9,000 tuition bill that must be paid before he can finish school. 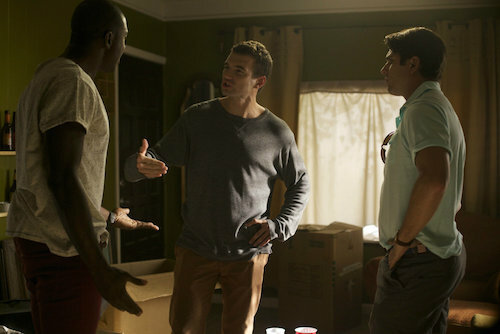 Sam’s friend, Pierce (Miles Fisher from Final Destination 5), convinces Sam and their two friends, Baker (Max Adler from “Glee”) and Tyler (Shark Night 3D‘s Sinqua Walls), to go to a church service with him. After seeing how much money the churchgoers were tossing towards their religion, the desperate-for-money guys come up with a plan to form a ministry and collect donations for a fake charity. Their efforts get them noticed by a real missionary named Callie (Paranormal Activity 3‘s Johanna Braddy) who hooks them up with Ken (Requiem for a Dream‘s Christopher McDonald), a minister who, along with his prayer leader, an enigmatic rocker named Gabriel (Zachary Knighton from “Happy Endings”), runs an organization called Cross Country which takes ministries on road tours. Ken offers to get the guys onto a national tour, and the guys agree, planning to skim money from their donations for their own needs. The “God Squad,” as the guys are now known, puts together a persuasive show that convinces people to look inside themselves for their faith and, more importantly, donate money to their cause. The guys are a huge success, but guilt starts to hack away at them. Not only that, but Sam starts to fall for Callie, who he learns is Gabriel’s girlfriend. The God Squad has to struggle between doing what helps them financially and doing what’s right. Believe Me is a pretty fun journey. Watching the God Squad embark on their money-grubbing mission and seeing how they evolve and mature is fairly entertaining, if a bit predictable. It’s a variation on the buddy flick, but told with more wit and originality than the average movie. The film doesn’t ever get too heavy, despite being centered on the bilking and milking of organized religion. There’s actually a surprising lack of conflict and suspense considering that the audience knows from the start there’s no way that the God Squad can keep up their utter insensitivity for the entire run of the film. But that’s all forgivable; the film is both enjoyable and entertaining, and that’s really all that counts. Will Bakke and Michael B. Allen have a message with Believe Me. It’s not an overtly Christian film, but the undertones are there. Like their documentary films, Bakke and Allen foster free thought and encourage their audience to question everything and come up with their own solutions. In Believe Me, the main characters come to this epiphany without the film getting preachy or shoving faith down the audience’s throat. At the end of the day, Believe Me is basically a fish-out-of-water story, with the God Squad trying to figure out where they fit into the scheme of what they have inadvertently created. It’s message is to figure out what parts of faith work for the individual, and Believe Me practices what it preaches by letting the viewer figure it out for themselves. Believe Me is being sold as a comedy, but the laughs are few and far between. That’s not to say it’s not funny, but the humor is not at the forefront of the story. Most of the humor is derived from the God Squad’s ignorance as they are trying to fit in with the Church. They decide that they have to look, dress, and act like Christians, so they set out to learn scripture and prayers, giving each specific action and verse its own name, with predictably hilarious results (they call one of their prayer postures the “Shawshank” – standing with both arms outstretched, mimicking Tim Robbins on the poster for his famous movie). Other laughs come via simple word gags, such as one character’s Christian clothing line that he nicknames “Cross-Dressing” (get it? Cross…dressing?). There are cute little chuckles like that, but the movie doesn’t lean too much on its comedy aspects. Believe Me is a solid film that just happens to have some funny bits.